If you are a smoker or someone in your household smokes, you know how difficult it is to get rid of the unpleasant smoke odors and toxins from your home. As you’re on this page, I’m assuming you also now know the benefits of buying an air purifier for smoke. Weed smokers suffer from the same problem as cigarette smokers do. However, the weed odor is even stronger than the smell of tobacco and since marijuana is still taboo for many people, such smell can cause problems with neighbors. In the reviews below, I basically found that the best air purifier for weed smoke was equally adept at handling cigarette and cigar smoke. There were no disparities. Small particles created by cigarette,cigar and cannabis smoke adhere to the surfaces in your home, including furniture, bedding, curtains, shelves, and pillows. They stay there, emitting unpleasant odors that are almost impossible to get rid of with regular air filters. Even if you open the windows when you’re smoking, it still gets into your home and settles on your belongings. This unfortunate side effect of smoking doesn’t just harm the smokers, it emits second hand smoke into the air for everyone in your house to breathe.So family members and even neighbors are also left frustrated with constantly facing this unpleasant smell. A simple way to deal with this problem is to get an air purifier. However, not all of them are created equal. Most air purifiers fight against pollen, allergens, and pet dander but only some can take care of smoke and the odor it causes. 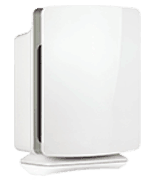 So unfortunately, you can’t just go for the most popular air purifier and be done. You need to do a spot of research into the brands and what to look for. My buyers guide is designed to help you choose the right smokers air cleaner for you and your home. 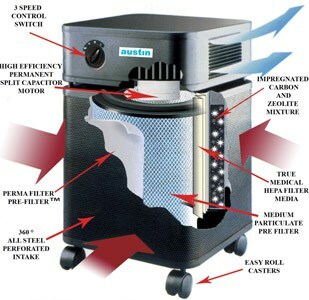 The best air purifier for cigarette smoke removal must have a HEPA filter and an activated carbon filter. A Carbon filter is a key part of the smokers air purifer as it’s tasked with the initial filtering the odors and contaminants associated with smoking before the HEPA filter finishes the job. Typically the unfiltered air is pushed through a compressed active carbon bed that sifts out any unwanted impurities by using chemical adsorption. No other element is as capable of this as carbon..or charcoal as you may know it. 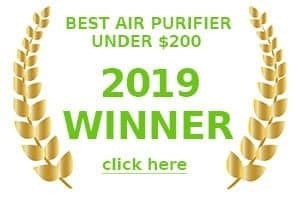 From all of my reviews, I picked the best 4 air cleaners for weed smoke removal, which is typically considered the most odorous of all smoke related air problems so will therefore do an equally good job at dealing with cigarette and cigar smoke too. Check out the results below. You don’t have to be a cigar or cigarette smoker to deal with the problems that come with smoke-polluted air. Many people suffer from the smoke that comes from fireplaces or forest fires among a host of other reasons. So if you own a fireplace or live in a place with high wildfire frequency, you should still consider investing in a good smoke air purifier. Once more Alen wins another accolade. If you read some of our other pages, you can see that we have awarded it the gold in several other catagories too. I thought it was apt to also give it our award for the best air filter for smoke and weed odor too. The reason the Breathe-smart is able to keep coming top in multiple catagories, is because you can customize it to your needs. It comes with different add-on filter packs that tailor it to your specific requirements. For example, in the case of dealing with Smoke smells, you would want to buy the Odorcell addon, which costs around $30 extra.. The HEPA-OdorCell Filter technology is without question one of the best odor eating filters for smokers money can buy right now and I would strongly recommend it to anyone. Especially those that have a rather large area to purify – as this Alen filter can work in massive spaces up to 1100 sqft. So easily good enough to cover most basements or large living rooms. It comes with sensors that are constantly checking the level of purification that your room needs, so that it can automatically adjust the filtration, so as to save power and filter replacement, while still cleaning your room air to the best standard. The buttons are easy to use and also hidden out of the way behind the unit, to maintain that sleek look it has. As we’ve stated in our main review, it comes with a huge array of front panel colors, so you are sure to find something that suits your homes interior decor. 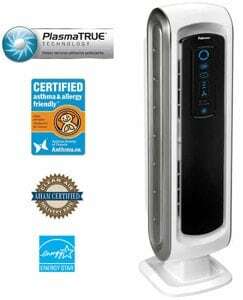 This air purifier continues to get the best reviews from industry professionals and individual user reviews alike. I chose the Rabbit Air MinusA2 due to its 6-stage filtration system (which includes 2 odor removing filters), amazing high-tech design, a built-in ionizer, and a mood light option. This is one of the most expensive models I’ve reviewed so I wanted to see if the air purifier is really worth the money the manufacturer is asking for it. The compact design of this model made me a little skeptical about the claim that it covers 700 square feet so I really wanted to explore that aspect further. This 6-stage filtration system looks very impressive and seems to be just what the doctor ordered for the households that need to deal with smoke. However, the annual maintenance can be rather pricey. The filter kit costs about $75. A lot can be said about the design of this unit. Rabbit really put some thought into the styling of the Air MinusA2. While it’s not too lightweight (almost 24 pounds), it looks sleek and can be installed absolutely anywhere in the room, including the walls. The wall mounting kit will cost you an extra $10. Out of all the air purifiers I reviewed so far, this one gets a solid 5-star rating for the design. There is no need to hide it anywhere. It complements virtually any décor. The unit is equipped with a mood light that makes it a great little night light. The soft blue and pink color can be dimmed or turned off to avoid sleep problems. 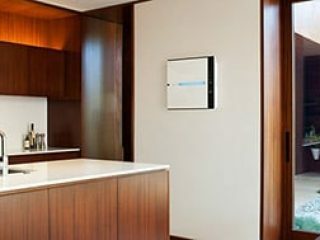 It also comes with a remote control which is a great advantage for people who want to hang the purifier high on the wall and out of the way. The Rabbit Air MinusA2 is equipped with an odor sensor which is a wonderful feature for people who are dealing with smoke on a regular basis. As soon as the machine senses smoke, it automatically increases the fan speed. However, there is no particle sensor. Accordingly, the auto mode only helps when the odor levels are up but won’t adjust the speed if there are too many harmful particles in the air. The unit also features a light sensor. As soon as the room goes dark, it automatically goes into the sleep mode. This is a useful feature for people who want to use the air purifier in the bedroom. As soon as the lights go back on, the unit switches back to auto mode. This air purifier is one of the quietest units I tested so far. There are 5 fan speeds. The above indications mean that you can sleep without being disturbed when the fan is set on 1st, 2nd, and even 3rd level. Even when the highest fan setting is on, the unit is quieter than most of the other air purifiers. This is truly impressive. While the manufacturer seems to claim that this air purifier can service a room up to 700 square feet, a good look at the CADR number would suggest that it’s only capable of cleaning a room up to 500 sq ft in size. When you pay around $500 for the unit and $75 a year for replacement filters, you expect a long-lasting warranty coupled with stellar customer service. Rabbit Air seem to take good care of both. It offers a 5-year warranty and claims 24/7 technical support. After reading many different reviews, I found that both claims are genuine. Overall, I’m fully satisfied with what the Air Minus A2 has to offer. The 6-stage filtration system is like heavy artillery in your fight against harmful particles and especially smoke. 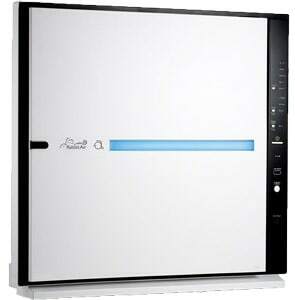 I really liked the fact that this model has 2 separate filters specifically designed to deal with smoke and odors. The only disadvantage is the price, however, I can say that the unit is worth the money you’ll be paying for it. Besides offering high-quality protection, it’s also one of the quietest models I’ve reviewed. I would recommend this air purifier to people who deal with smoke on an everyday basis and are not afraid of high maintenance costs. 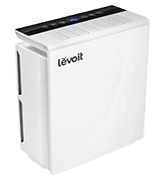 I chose this particular model due to the medical-grade HEPA filter that, as per the manufacturer’s claims, does a great job fighting fumes and odors. It also houses a large activated carbon filter that’s known to do a good job eliminating smoke-related smells. The Austin Air Healthmate is capable of cleaning a large surface area – up to 940 square feet and has caster wheels for easy moving. Pre-filter #1 – Removes large particles from the air. This pre-filter is washable and should be cleaned about once a month. Pre-filter # 2 (medium) – Removes the large particles missed by the first filter. This pre-filter is also washable and should be cleaned about once a month. Activated carbon and Zeolite filter – This filter deals with chemicals, odors, and gasses. Zeolite attracts water, accordingly, this air purifier can’t be used in high-humidity places, such as pool areas, and bathrooms. 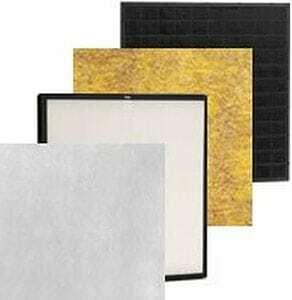 Medical grade HEPA filter – This filter is supposed to filter out 99.97% of particles not less than 0.3 micron in size. However, Allergy Buyers Club ran some tests that showed that the unit deals with about 85-89% of the particles, which is also pretty good. The main advantage of this filtration system is that the filters don’t need to be changed too often. Besides, Austin offers some discounts on filter packages, which I will talk about a little later. I can’t say that I’m satisfied with the design of the Austin Air HealthMate. It’s very far from being sleek and compact. In fact, it’s nothing of the sort. This air purifier is big! It’s a whopping 14.5 x 14.5 x 23’’ and weighs about 50 pounds. Thankfully, the manufacturer thought about adding caster wheels which make it easy to move the unit around since lifting it is, obviously, problematic. There are no digital control panels or remote control, so the fan speed is controlled manually. Since the air intake is done from all around the unit, this air purifier can’t be placed against a wall and since the unit is large and can’t be hidden in a corner, it takes up a significant amount of space. However, thanks to the design, it appears sturdy and well-built and doesn’t look too bad in my opinion. Some people report that when the unit is at the highest fan setting, watching TV can be problematic. However, the noise is steady and the two lower settings are easy to get used to. 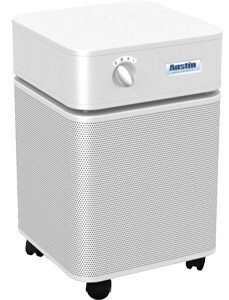 The Austin air Healthmate is not equipped with any sensors.This is unfortunate since it’s hard to tell when the air is polluted enough to turn up the fan setting. I would recommend keeping the unit running on the highest setting for at least 12 hours before switching it to medium. Then I would run it for another 12 hours at medium and only then switch it to low. The low setting is good enough to keep the air fresh after you do initial cleaning at high settings. However, if you smoke in the house, you’ll need to use the high setting for at least an hour after smoking so it can do a good job dealing with the odor. Heavy smokers will need to keep the unit running on high or medium all the time. I’d like to pay special attention to Austin’s warranty which is quite spectacular. The manufacturer offers a 5-year mechanical warranty on all of its products. This includes any defects and problems you might encounter within a 5-year period after purchase, providing you use the unit as stated in the manual. In order to get this warranty, you must register the unit on Austin’s website. Here comes the best part. Austin gives a warranty for its filters too. 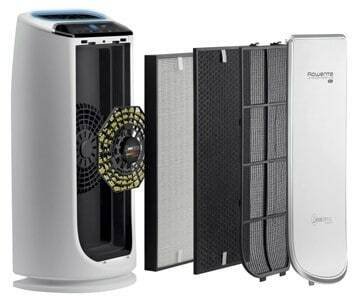 Since maintenance costs for most air purifiers are rather high, this warranty comes in very handy. 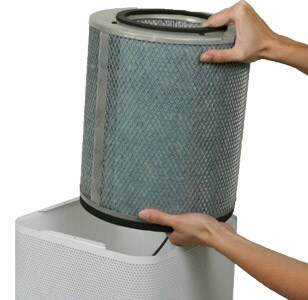 If used under normal conditions, the filters that come with the unit should last for about 5 years. This warranty made me reevaluate the cost of this air purifier. While the initial price of the unit seems high, the amount of money you’ll save on the replacement filters is impressive. While this unit seems to have a few disadvantages, such as large size, no sensors, high price, and a loud noise, it really does its job very well and sometimes that comes with a price. Austin say their machines excel at dealing with pet dander – I think this is a fairly valid statement as it has all the right filters that all do well in testing. After spending long hours browsing through customer reviews of the Austin Air HealthMate, I found that 95% of them were positive. This is a spectacular rate for any air purifier. I would recommend this unit to heavy smokers who need to keep their house free from harmful particles and unpleasant odors. I chose this particular model because of the patented Nano Capture filter that destroys the formaldehyde produced by the smoke. It’s also equipped with a HEPA filter, an activated carbon filter, and a sensor that adjusts the fan speed depending on the air pollution levels in your home. At a great price point, this newcomer from Rowenta looks like it might be a strong contender. This unit has a four level filtration technology and I took a close look at each one of the stages. Pre-filter – This filter is designed to capture large particles from the air to make the work of other, more sensitive filters, easier. A big advantage of this pre-filter is that it’s washable. Activated carbon filter – This must-have filter for all smokers fights the odors that cause great discomfort. 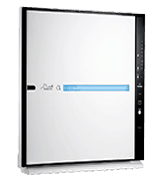 HEPA filter – Removes the smallest harmful particles, such as allergens, bacteria and mold spores. Nano Capture – This Rowenta’s patented filter destroys formaldehyde that’s emitted by tobacco smoke, paint, building materials and even aroma candles. Formaldehyde is a dangerous gas, the existence of which we don’t even notice. It can lead to certain types of cancer. I want to pay special attention to the coverage area of the Rowenta PU6020. While it states that it can clean a room up to 835 square meters, when you calculate the area using the CADR rating (203), it turns out that the maximum coverage area of this device is about 315 square ft. When you read the label closely, you’ll find out that the manufacturer actually claims that the unit services surface area of up to 835 square feet. What a great advertising trick! This is an unfortunate discovery which doesn’t make the purifier itself any worse but should make you think twice before installing it in a large room. The PU6020 is equipped with several smart sensors. One of them measures the air pollution levels in the room and adjusts the fan settings accordingly. Another one allows you to turn on the night mode – which works fantastically well. The fan is at the lowest setting which makes the operation close to silent. Meanwhile, the lights are dimmed so they won’t interfere with your sleep. There is also a filter replacement indicator on the control panel which will tell you when the filter needs to be changed. This air purifier is also equipped with a timer which makes it easy to plan the operation of the device even when you are not at home. This model has 4 fan speeds. The highest two speeds are rather loud and might not just interfere with your sleep but become a problem if you want to work in a quiet room. The lowest fan setting is almost completely silent, which is a big advantage for light sleepers. The second fan setting is more or less tolerable since it’s not louder than a quiet conversation. The fan also provides some white noise which can be an advantage to people suffering from insomnia. The Rowenta PU6020 is rather large and heavy. It weighs almost 23 pounds and the dimensions are 15 x 12.4 x 29.5 inches. However, a nice and simple design of this unit coupled with the white color makes it easy to fit into any room’s décor. In some reviews that I studied, I found that the buttons on the control panel can be a little hard to push but this should go away with time. Rowenta offers only a 1-year manufacturer’s warranty on this unit. The warranty is valid only in USA, Canada, and Mexico though. You must have a proof of purchase to take advantage of the warranty. I don’t appreciate such a short warranty since this is usually an indication that a manufacturer doesn’t believe that the product will work longer than 1 year. However, I’ve read reports from people who have been using this unit for several years and didn’t encounter any problems. 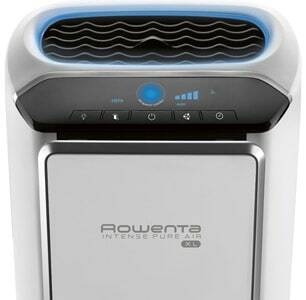 Overall, I’m satisfied with the Rowenta PU6020 Air Purifier. It has everything a good air cleaner that fights smoke should have and more. It offers extra protection from the formaldehyde produced by the smoke, which most air purifiers don’t do. Quiet operation and the night mode allow this unit to be used in the bedrooms. 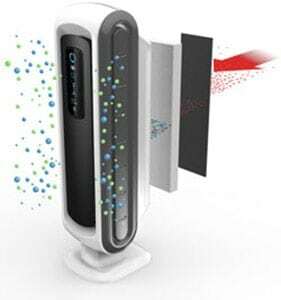 I would recommend this air purifier to people who have to deal with smoke on a daily basis. I chose this particular model despite it coming just a tiny bit over $100 it really is the best budget air purifier for smokers. Just becuase the aeramax comes into the cheap air filter catagory does not mean it’s not a quality product, just that it represents the best value. It comes equipped with a true HEPA filter and an activated carbon filter – which is mandatory for any smokers air purifier. This unit actually boasts 4 air filters and some other interesting tech. So, lets see how well it does does. Also of note is that the AeraMax 100 comes fitted with multiple sensors designed to notify you of a sudden air quality change and also to advise you when it’s time to change filters. HEPA filter – This is a true HEPA filter and as such is designed to do most of the work in fighting off bacteria, germs and allergenic particles. It will also go someway towards filtering out any bad chemicals given off by the smoke that got through the carbon filter. 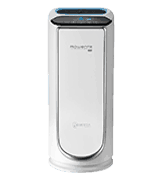 AeraSafe antimicrobial treatment – This is AeraMax’s patented technology that helps clean and prevent growth of odor-causing bacteria, fungi, mildew and mold inside the actual unit, which can happen – especially on the Hepa filter. Plasmatrue – The unit comes equipped with a particle ionizer which can negatively charge contaminated particles, making them easier for the other filters to remove them. The Aeramax 100 has a CADR rating for smoke of 68, which means it’s only really effective in small rooms of around 100sq feet – but at this price, it’s all you’re really going to get. If your room is bigger than this, but your budget does not allow you to buy a more expensive air cleaner, a trick that some people employ with these small air filters, is to place them close to where ever they might be. So, for example I have a smaller unit like the Aeramax sitting on my desk in my office as I type this. Whilst my office is much bigger than 100sq ft, I know that the air purifier is still doing a great job cleaning the air in my immediate vicinity. One of the other great advantages of small units such as this, is that they are incredibly light and therefore easy to move around the house if you need to purify more than one space. The aeramax 100 comes equipped with multiple sensors. For an air cleaner in this price bracket – that’s an awesome find. 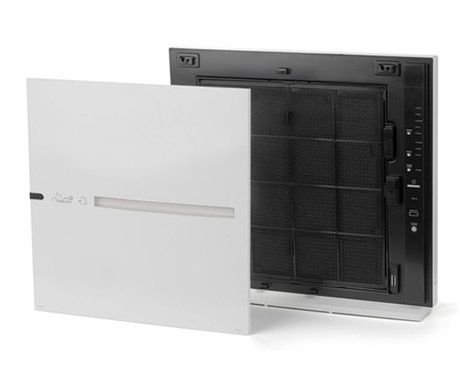 The unit features patented AreaSmart technology which continouously monitors the air quality for signs of smoke or other impurities and will automatically adjust the speed of the fan to maintain perfect air quality. The front panel of the device will light up red when problems with the air have been noticed and will revert back to blue when the issue has been delt with. 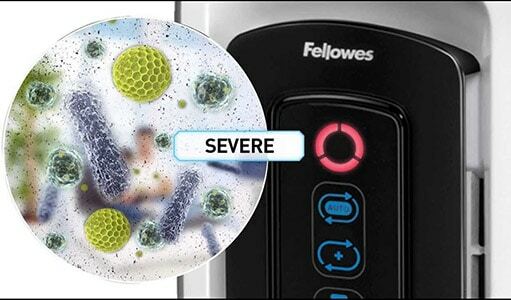 All Fellows air purifiers also come equipped with filter change indicator that constantly monitors the HEPA filter and will notify you when it’s time to change it. When Fellows designed the Aeramax series of air purifiers – they had several goals in mind. One of which was most certainly that the range had to operate as quietly as possible. The result is that this base model comes with 3 fan speeds – all of which are super quiet. On fan speed 1 – the unit is barely audible to the human ear!, fan speed 2 is about the same volume as someone whispering, whilst fan speed 3 is definitely louder. About as loud as a cat purring. I was very impressed with the noise levels of this device. Considering the only time you would ever need to turn it up to fan speed 3 is immediately after smoking, I can honestly say that you will have no problems with noise from it. 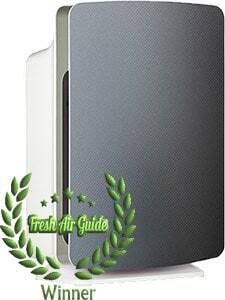 Without question I can recommend this air purifier for use in the bedroom for light sleepers. I really like the look of tower air cleaners. They just look very sleek and modern. Perhaps my view of them will change in the next decade and I will start to turn my nose up at how out dated they look. But for now, I’d say this is one of the more futuristic looking tower units on the market. The plastic shell is designed to look like a nice smooth brushed metal, with a very simple black front panel that includes the most futuristic of all inventions – blue LED lights! Quite when blue LED’s became synonymous with the future I don’t know – but our view of the modern future remains the same as we enter 2019! Fellows say that excellent after sales support is one of their main priorities as a company and their user reviews certainly support this statement. They offer a 3 year limited warranty, which for a low cost device like this, is really rather good. Overall, I’m really pleased to recommend the Aeramax 100 as one of the best value air purifiers for smoke on the market in 2019. Whilst it will struggle to effectively clean the air in medium to large rooms, it will do a superb job of smaller rooms and individual air space. With it’s built in activated carbon filter and Ionizer, it will do a fantastic job of removing any smoke smells and that includes the incredibly pungent weed and cigar smoke odors. The super quiet fan speeds mean you can quite easily place this right next to your bed and not be worried about the noise levels. And finally, it looks really well built with a fantastic modern design that will complement any home.